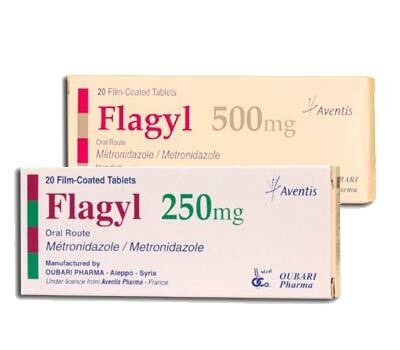 Most veterinarians will prescribe metronidazole, the generic version of Flagyl, to lower the cost of medical care. If you’ve had hounds for any length of time, you’ve probably experienced it – the gas, the runny, stinky stools, the “blaps.” We’ve taken our dogs to the vet, who has looked at stool samples and then handed us a bottle of bitter-tasting pills called metronidazole (pronounced: met-roe-NYE-duh-zole). We understand it’s some sort of antibiotic, the dogs hate the taste, and most of the time they get better, if we can get all of it down them. Just what is this stuff? Metronidazole is a synthetic antibiotic that was developed in the mid-1950s. Marketed by Searle under the brand name Flagyl®, it also is available as a generic drug manufactured and distributed by numerous firms, including Sidmak Labs, Zenith Goldline, Teva Pharmaceuticals USA, and Danbury Pharmaceuticals. The drug has both antimicrobial and antiprotozoal properties, which means it kills both bacteria and protozoan parasites. It is most commonly given to dogs for two reasons: to kill the protozoan called Giardia, which lives in water, or to kill a variety of the bacteria Clostridium, which lives in the intestines and usually causes no problems. However, some other types of antibiotics can skew the balance of intestinal flora and allow an overgrowth of this type of bacteria, which results in diarrhea. We had this problem with our hound JC, who had surgery and was given a 10-day course of the antibiotic cephalexin (Keflex®). Shortly thereafter, I came home to an accident on the carpet. Tests at the vet revealed an overabundance of Clostridium, and our metronidazole adventure began (more about that later). Metronidazole is only effective against anaerobic bacteria, which flourish in the absence of oxygen. It kills these organisms by disrupting their DNA synthesis. Fortunately, resistance to the drug is rare. Metronidazole can also be prescribed for dogs with irritable bowel syndrome, as it has anti-inflammatory effects on the intestines, though it is not well understood how the drug does this. Occasionally it will also be prescribed for oral infections like abscesses and gum disease. While the FDA has never officially approved metronidazole for use in animals, it has been used safely and successfully for a long time and is considered the first line of defense against Giardia, mainly because of its modest price. Also, since Giardia can be difficult to detect, and metronidazole is also effective against other organisms that can cause diarrhea, a cure can occur even if the diagnosis is not correct! There have been high-dose studies in rats that have led researchers to believe that metronidazole may cause birth defects. No studies have been done on dogs, but it is best to avoid its use in pregnant animals just to be safe. The drug does appear in breast milk, so it should not be given to nursing animals. Those with impaired liver function should also not be given this drug, and dogs who are taking anticoagulants, phenobarbital, phenytoin (Dilantin®), or cimetidine (Tagamet®) should either not be given the drug or be monitored in case the dose needs to be adjusted. In addition, while it is obviously never recommended that dogs should have alcohol, accidents do happen, and the consumption of alcohol while on metronidazole can cause a severe reaction (nausea, vomiting, cramps), so make sure you keep the wine and beer glasses out of reach of a curious needlenose. The most serious side effects this drug can have are on the nervous system, with symptoms of staggering, disorientation, nystagmus (rapid eye movement), head tilt, rigidity, and even seizures. These effects are most often seen in animals that are on metronidazole for long-term problems. If any of these symptoms appear, discontinue the drug immediately and call your vet. As far as your dog is concerned, though, the biggest drawback to metronidazole is the taste, as I found out with my JC. I was able to slip the three large white tablets into his food twice a day for the first few days, but after that he was on to me and wouldn’t eat them. So then it was time to pill him – and if I didn’t get the pill far down enough, he wouldn’t swallow it. I’d be holding JC’s head, stroking his throat, while he stood stock-still, refusing to swallow. As the minutes went by, gobs of saliva would emerge from the corners of his mouth and slide down the sides of his neck. I knew that awful-tasting tablet was dissolving on his tongue, and yet, he just refused to cooperate in his polite, greyhound-like way. What to do? One solution is to visit the health food store, pick up some empty gelatin capsules, crush the tablets and put the powder in the capsules. This keeps the stuff from melting on the tongue right away. Some people also have success with dipping the pills in butter to help them slide down the throat. Another solution is to ask the vet for another drug that will work, but they are typically more expensive than metronidazole, so there is a tradeoff there. The tablets can also be crushed and mixed into a liver-flavored liquid by a compounding pharmacy, but this too is an expensive (and, as we found out, a bit of a messy) solution. Whatever you decide, though, the final reward is a healthy dog, and that is a priceless thing! Since metronidazole is so commonly prescribed for intestinal ailments, it is very likely that if you haven’t already had to give it to your Greyhound, you probably will at some time in his or her life. Hopefully this article has prepared you to be an informed soldier in the war against diarrhea. Sources: The Pill Book Guide to Medication for Your Dog and Cat, by Dr. Kate Roby, VMD, and Dr. Lenny Southam, DVM; the Veterinary Drug Handbook, Third Edition, by Donald C. Plumb, Pharm.D.